This book is so rich. It is a book about human trafficking. That is such a big subject, that I think most books about human trafficking would be about only that. But this book is also about acting and horses and flowers and parades and divorce and community, about speaking out and doing your part. Bauer's heroines are courageous and Anna is no exception. Her parents are separated because her dad has anger problems. And so she goes to stay with her grandma. While there, she witnesses a girl about her age (twelve) being forcibly taken to the bathroom. The woman who is with her goes into the single occupancy bathroom with her and then back out to their van. When the girl tries to jump out of the van, Anna knows there is something seriously wrong. This book is a good cure for bystander apathy. How many times have we seen something wrong and talked ourselves out of it? Anna doesn't know what to do at first, but she doesn't let it go. I felt like there was too much pressure riding on Anna. She felt responsible for helping her parents overcome their differences. She also felt solely responsible for the girl she had seen. I felt like these burdens were unfair and too big for her to carry. At the same time, people like her can move mountains. I was surprised to find this in the juvenile section at the library because I think of Bauer's arena as young adult. Because it is about human trafficking, I would introduce it to the young reader cautiously. But it certainly doesn't go into lurid detail about the victims' situation. One thing that irked me a little bit was the politics submerged within the story. Homeland security was treated as a superhero while the Vietnamese were nothing but villains and victims. I know human trafficking is bad, really bad, but I felt like the dynamic between the law and the criminals glossed over a lot of complexity of reality. 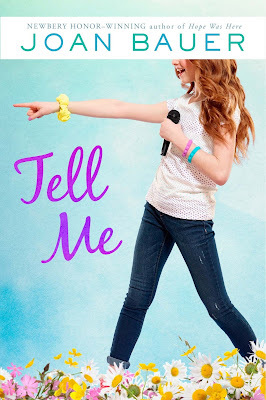 Tell Me continues in the strong formula Bauer is known for: a brave heroine with a strong occupational interest, a wise adult mentor, and an overt moral message. Better than Squashed or Peeled, not as good as Backwater or Hope Was Here.